ABOARD THE REGAL PRINCESS – Opening the door to my Regal Princess cabin, I knew this was the perfect place for me. A balcony will be a great spot to watch the ocean roll. It has two chairs and a small table, plus privacy screens on both sides. The lower half of the balcony is Plexiglas so the ocean view is not obstructed. Large sliding glass doors lead outside to my balcony so I can see the ocean rolling even when I am in bed – if I leave the curtains open. A whopping 1,438 cabins on the Regal Princess have balconies. That is 81 percent of the ship’s total 1,780 cabins which should make many passengers happy. 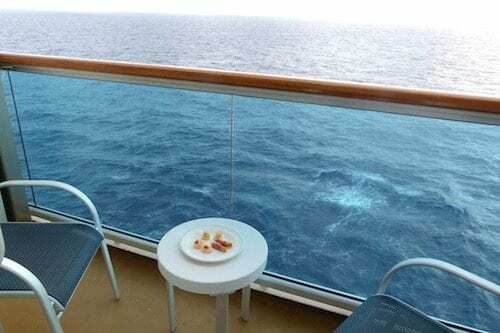 Being able to sit on my own private balcony late at night or early in the morning is one of the prime pleasures of cruising, in my opinion. The Regal Princess also has 342 interior cabins, plus some suites and mini suites and 38 wheelchair accessible cabins. I didn’t see any of those but I can tell you about my stateroom. It is No. 735 on Deck 10 also known as Caribe Deck. Entering the cabin, the cruise card goes into a slot on a wall inside the door. That turns on the lights in the cabin which saves on electricity when no one is in the cabin to use those lights. The slot is also a secure place to put your card when you enter the cabin and pick it up when you leave. The bathroom offers a walk-in shower, plus wall dispensers for shower gel and a shampoo/conditioner combo. Almost every cruise I’ve been on, some passenger on the first day is flagging down a room attendant saying they can’t turn on the lights in their room. Sure enough, that happened today. As I walked to my room, the passenger in the cabin down the hall said there was something wrong with the lights in her room. I showed her how to put her cruise card in the slot by her door and she laughed about the new-fangled technology. All it takes is once to learn. 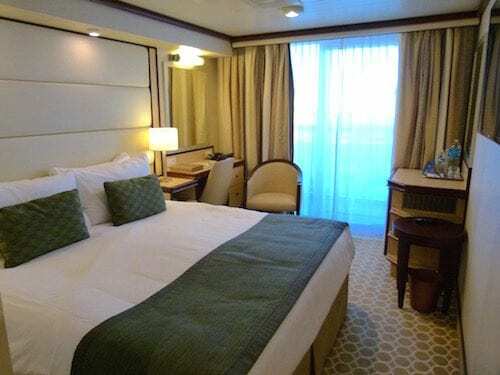 My stateroom is decorated in neutral shades of cream and tan with light wood and a tan-patterned carpet that looks like honeycombs to me. On the wall opposite the bed is a big flat-screen TV with remote control. In-room movies and TV shows on-demand are free. Ship shows also are shown, including updates from the cruise director and information about various ports we will be visiting on our cruise. 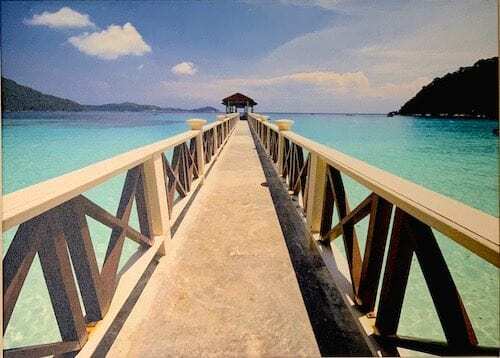 A big colorful painting on the wall depicts a lovely boardwalk stretching into an ocean scene. Quite a nice sight but it can’t compare to the real ones outside by sliding glass doors. My private balcony is going to be one of my favorite spots. I have a queen-size bed since I am a solo traveler. The room also has two bedside stands with lamps, a fair-sized desk with a mirror and a chair, another armchair and round table, and a small refrigerator inside a cabinet which also serves as a counter with three shelves on the side. Between the end tables, desk and counter, my room has plenty of drawers. In addition, there is hanging space, hangers and more shelves in an open closet. A closed closet with shelves also has a safe. The desk has a ship-wide telephone and a stationary hair dryer in the top right drawer. I heard someone asking the room attendant for a hair dryer because the passenger must not have opened all the drawers to discover the hidden hair dryer which they probably thought would be in the bathroom. I don’t use a hair dryer so I don’t know how good it is. Complimentary white robes are available for use while on the cruise. If one isn’t in your cabin, just ask the room attendant for one. 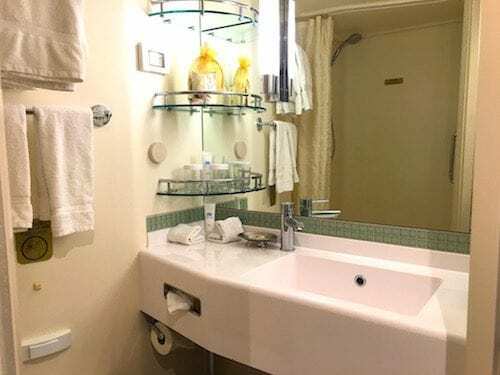 The bathroom was small but big enough for me with a vanity, commode and shower. Shelves above the vanity offer even more storage space. The walk-in shower has a shower curtain and wall dispensers with Lotus Spa shower gel and a shampoo/conditioner combo. I prefer to use a shampoo and then a conditioner so would bring my own next time. The vanity has a bar of soap and a tube of hand lotion. Bedcovers are white European-style duvets and linens topped with posh fluffy pillows. The cabin attendant comes in every night while I am at dinner, turns down the bed, leaves two chocolates on the pillow and removes the two green cushions and strip of green material at the bottom of the bed. He also leaves the next day’s Princess Patter newsletter on my bed. That’s it. I’m quite comfortable here. So now I am off to explore the ship. Will let you know what I find.